Truck freight movement gets a subsidy of between $57 and $128 billion annually in the form of uncompensated social costs, over and above what trucks pay in taxes, according to the Congressional Budget Office. If trucking companies paid the full costs associated with moving truck freight, we’d have less road damage and congestion, fewer crashes, and more funding to pay for the transportation system. During National Infrastructure Week earlier this month, we again endured what has become a common refrain of woe about crumbling bridges, structurally deficient roads, and a lack of federal funding for infrastructure. This call for alarm was quickly followed by yet another Congressional band-aid for the nearly bankrupt highway trust fund – and this one will hold for just sixty days. It’s clear that our transportation finance system is broken. To make up the deficit, politicians frequently call for increased user fees – through increased taxes on gasoline, vehicle miles traveled, or even bikes. All the while, one of the biggest users of the transportation network – the trucking industry – has been rolling down the highway fueled by billions in federal subsidies. A new report from the Congressional Budget Office estimates that truck freight causes more than $58 to $129 billion annually in damages and social costs in the form of wear and tear on the roads, crashes, congestion and pollution – an amount well above and beyond what trucking companies currently pay in taxes. CBO doesn’t report that headline number, instead computing that the external social costs of truck freight on a “cents per ton mile basis” range between 2.62 and 5.86 cents per ton mile. 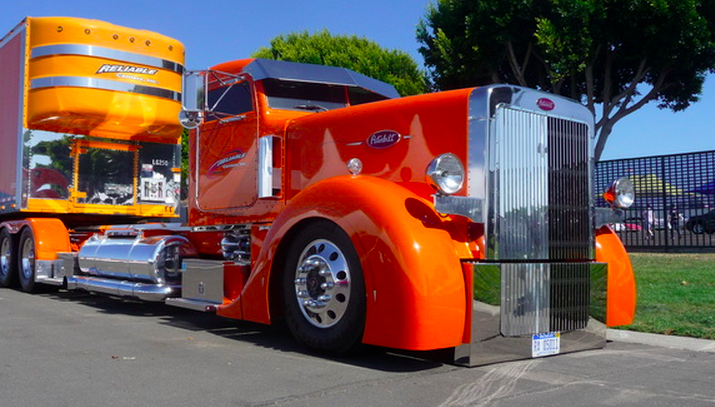 For the average heavy truck, they estimate that the cost works out to about 21 to 46 cents per mile travelled. That might not sound like a lot, but the nation’s 10.6 million trucks travel generate an estimated 2.2 trillion ton miles of travel per year (Table A-1, page 32). When you multiply the per ton mile cost of 2.52 to 5.86 cents per mile times 2.2 trillion ton-miles, you get an annual cost of between $57 and $128 billion per year. Unfortunately, trucking companies don’t pay these costs. They are passed along to the rest of us in the form of damaged roads, crash costs, increased congestion and air pollution. Because they don’t pay the costs of these negative externalities, the firms that send goods by truck don’t have to consider them when deciding how and where to ship goods. This translates into a huge subsidy for the trucking industry of of between 21 and 46 cents per mile. For comparison, CBO looked at the social costs associated with moving freight by rail. Railroads have much lower social costs, for two reasons: first, rail transport is much more energy efficient and less polluting per ton mile of travel; second, because railroads are built and maintained by their private owners, most of the cost of wear and tear is borne by private users, not the public. 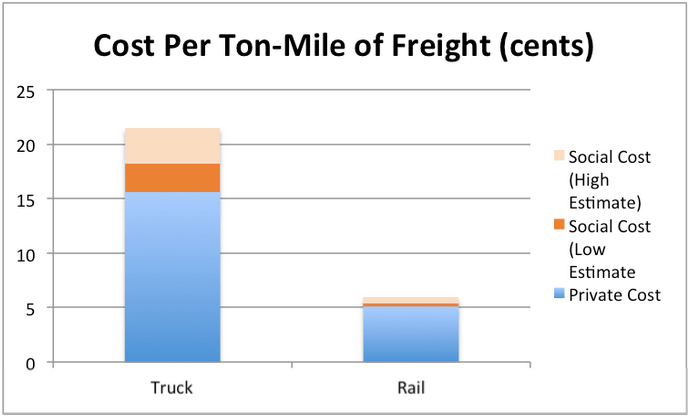 Railroad freight does produce social costs associated with pollution and crashes, but the social costs of moving freight by rail are about one-seventh that for truck movements: about 0.5 to 0.8 cents per ton mile, compared to 2.52 to 5.86 per ton mile for trucks. As we always point out, getting the prices right – whether for parking or road use – is critically important to creating an efficient transportation system. When particular transportation system users don’t pay their full costs, demand is too high, and supply is too low. In this case, large federal subsidies for trucking encourages too much freight to be moved by truck, worsening congestion, pollution and road wear, while the fees and taxes paid by trucking companies aren’t enough to cover these costs. The classic solution for these currently unpriced external costs is to impose an offsetting tax on trucks that makes truck freight bear the full cost associate with road use, crashes and environmental damage. The CBO report considers a number of policies that could “internalize” these external costs associated with trucking – including higher diesel taxes, a tax on truck VMT, and even a higher tax on truck tires. The revenues produced would be considerable: a VMT tax that internalized social costs of trucking would generate an estimated $68 billion per year. To put that number in context, consider that in 2014, total public spending – federal, state and local – on roads and highways was $165 billion. In addition, the higher tax would reduce freight moving by road – mostly by shifting cargo to rail – and lead to benefits of lower pollution, less congestion and less wear and tear on roads. We’d also save energy: net diesel fuel consumption for freight transportation would fall by 670 million gallons per year – a savings of about $2 billion annually at current prices. There are good reasons to believe that the CBO report is conservative, and if anything, understates the social costs associated with trucking. For example, the report estimates that social costs associated with carbon emissions at somewhere between $5 and $45 per ton. Other credible estimates – from British economist Nicholas Stern – suggest that the cost today is about $32 to $103 per ton, rising to $82 to 260 per ton over the next two decades. Such a tax would make truck freight more expensive, but other costs – now borne by the rest of us – would go down by a comparable amount. And there would be important savings in costs for freight either moved by other modes (especially rail, which is about two-thirds cheaper), or sourced from closer locations. There’s a clear lesson here: It may seem like we have a shortage of infrastructure, or lack the funding to pay for the transportation system, but the fact that truck freight is so heavily subsidized means that there’s a lot more demand (and congestion) on the the roads that there would be if trucks actually paid their way. On top of that, there’d be a lot more money to cover the cost of the system we already have. So the next time someone laments the sad state of the road system, or wonders why we can’t afford more investment, you might want to point out some 18-wheelers who are now getting a one heck of a free ride, at everyone’s expense.